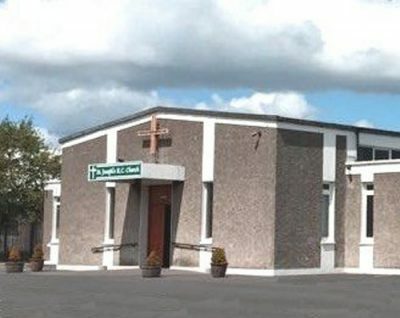 The altar used by Pope Francis when he celebrated Mass in the Phoenix Park in Dublin has found a permanent home in the north Dublin parish of Bonnybrook. This weekend parishioners were able to worship at the papal altar when their newly refurbished parish church reopened following five months of renovations. Last night (Saturday 9 March), the Archbishop of Dublin, Dr Diarmuid Martin, joined the parish for a celebration marking the re-opening of the church, St Joseph the artisan, entitled ‘New Beginnings’. Parish priest at Bonnybrook, Fr Joe Jones, said he hoped that the new sacred space would encourage people back over this special Golden Jubilee year for the Bonnybrook parish and in particular to see the altar and ambo used by Pope Francis. The altar and ambo were created for the closing Mass of the World Meeting of Families by the Specialist Joinery Group, based in Maghera, Co. Derry. John Bosco O’Hagan (from the Specialist Joinery Group) and his sister dressed the altar at Saturday’s Mass following its consecration by Archbishop Martin.